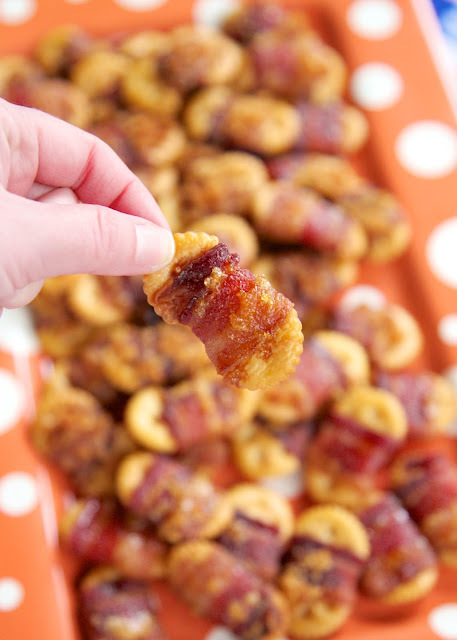 Bacon & Brown Sugar Crackers - SO good! You can't eat just one!! 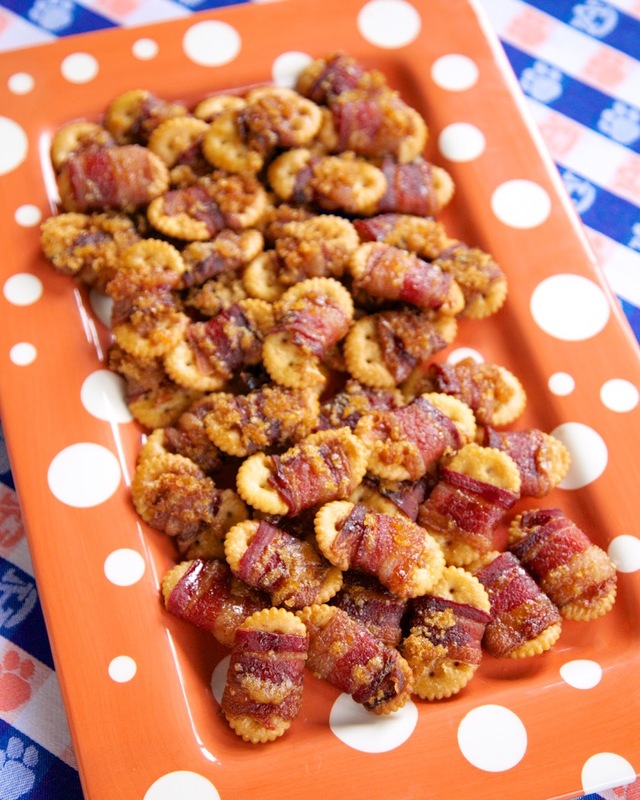 These Bacon and Brown Sugar Crackers are crazy addictive. I could not stop eating them! Sweet and salty at its best! I used Town House Crackers and regular sliced bacon. If you use thick cut bacon, it will take longer to get crispy and the crackers might burn. I baked these on a cooling rack on top of my baking pan. That helps keep the bacon and crackers crispy and not absorb all the grease coming out of the bacon. You can make as many of these as you like. I used the whole box of crackers and they were gone in a flash! Don't skimp on the brown sugar! Do these have to be eaten warm or are they just as good cold? They are good either warm or at room temperature. I've made these before using parmesan cheese between the bacon and cracker (no brown sugar). Those were yummy too. They can be served warm or cold. I guess depending if you like your bacon warm or cold. My friend had to heat a couple up real quick because he doesn't like cold bacon....me I like my bacon any way it comes. Oh my word! You are the football snack Queen - LOVE these!! Sounds yummy. The Pioneer Woman has a recipe similar to this but she puts parmesan cheese on the crackers and then wraps them with half a slice of bacon each. I think I'll try both lol. If you decide to look hers up she calls them Holiday Bacon Appetizers. Think these will be ok if I make them Friday night for Saturday's tailgate?? Brandi - I've never tried it, but they taste great at room temperature. I think they might be fine made ahead of time. You could even reheat them a bit before you head out to the tailgate if you wanted. ok - I think I am going to try it and I will report back. I could maybe pop them in when I am heating my buffalo or bbq chicken dip. Gonna be an early day since GameDay will be in town! Hail State! :-) Thanks for always making my tailgate fantastic! Do they really cook for 2 hours? I realize 250 is a lower temp, but I want to be sure about the time. Add some red pepper after you sprinkle with brown sugar! It gives a bit of a k8ck. Do you keep these in a container if you're going to serve them the next day, or are they not good left over.